I really don't know how this ever slipped under my radar - a fascinating bit of batshit craziness from the world of Orthodox Judaism. Tefillin are a couple of black boxes (made from from finest quintuple smooth kosher animal leather) which are tied to the forehead and upper arm with long winding strips of black leather. These boxes contain bible passages written on eentsy scrolls. What are they for? To wear during Morning Prayer. I guess prayers work better if you have a couple of expensive boxes containing unviewable bible verses strapped to your body. Jehovah sure must have one hell of a sense on humour. The scroll must be written with ink. The scrolls must be made of parchment. The boxes and their stitches must be perfectly square. 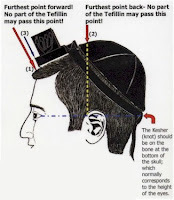 On the right and left sides of the head-tefillin the letter shin must be embossed. The scrolls must be wrapped in a strip of cloth. The scrolls should be bound with kosher animal hair. The stitching must be done with sinew of a kosher animal. A “passageway” must be made for the strap to pass through. The straps must be black. The straps should be knotted in the form of the letter dalet. And, as you can see from the diagram the accuracy of the placement is very important. Screw this up and presumably it's thunderbolt time from cheery old Jehovah. A full list of the rules for making and wearing tefillin may of course be found in Wikipedia. As well as me, at least one airline crew had never come across these silly things. A recent flight was diverted and quarantined after a 17 year old boy was seen strapping on a set of tefillin while seated in the cabin. Yep, it looked like some sort of bomb.